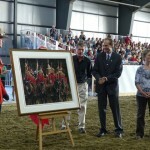 On Aug. 24, 25, & 26, the Musical Ride Artworks will be on display at the Comox Valley Fair. 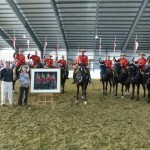 The RCMP Musical Ride will be performing at the fair and this will be only the second time that the RCMP Musical Ride and the Art series have been seen at the same venue! Come join us. 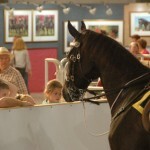 To learn more about the fair, location, and times please see their website. 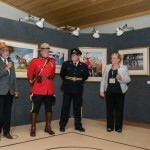 We were pleased to be invited by the Arrowsmith Agricultural Association to show the series as part of their Canada 150 Celebrations at the Coombs Fair in August 2017. To commemorate the event, Joan created #24 in the series which was unveiled at the fair during a special invitational event. 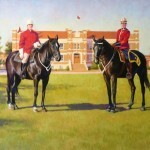 This artwork pays homage to the past and present history of the RCMP. 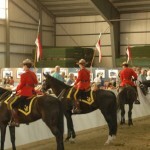 The setting depicts Depot in Regina and the 2 mounted officers represent historical and contemporary uniforms and gear. 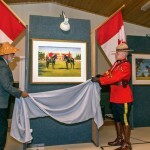 Unveiling the artwork is Chief Michael Recalma from the Qualicum First Nations and SS Marc Pelletier from the Oceanside RCMP. 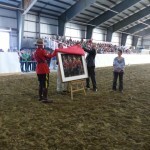 Acclaimed equine artist Joan Larson will unveil her latest piece in her ground breaking series of artworks celebrating the RCMP Musical Ride. 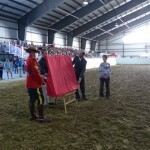 To commemorate this event, Joan has created a special piece, #23 in the series and along with RCMP Supt. Marty Chesser they will unveil the newest artwork. Officers and horses during the “Meet & Greet” with the artworks in the background. 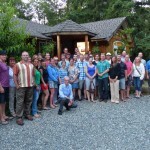 After the festivities of the weekend, Joan and Paul invited the Musical Ride officers and friends to a casual BBQ at their acreage. Pictured here in front of the studio, it was a special evening, one that will live in Joan’s memory forever. Opening Ceremony Monday, June 18th from 4 – 6 p.m. All Welcome. Hours: Tuesday – Saturday, 10 – 8 p.m.; Sunday 10 – 4 p.m. This is a free event sponsored by the Parksville Community & Conference Centre and is part of the lead up to Parksvilles’ Canada Day Celebrations! Powell River Town Centre Hotel, Powell River, BC. Opening Reception Friday, Mar. 11th, 7 – 9 p.m. In Celebration of Canada – See Joan Larson’s stunning Musical Ride Series in person. 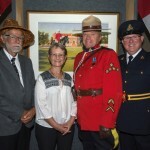 Joan Larson’s Creekside Studio releases RCMP Musical Rides Series Commemorative prints. 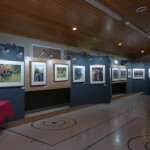 Visit www.joanlarson.com to preview of these and other unique Joan Larson images including an up-coming Sable Island Series. 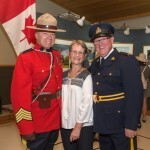 Joan Larson’s RCMP Musical Ride series will be featured on Chek 6 TV in a segment of Island 30 in a personal interview with Stacy Ross. Joan and Paul Smith (Marketing Manager, Creekside Studio) discuss their inspiration and passion for the series as well as their search to find a corporate sponsor interested in pairing with them to take the series across Canada. 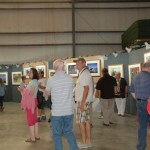 Joan will be participating in “Fish Ships & Lost Art Treasures“, a group showing at Whiskey Landing. 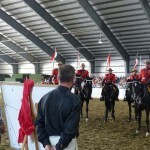 View Joan’s Vancouver Island Landscapes and sneak a peek of the RCMP Musical Ride Series. 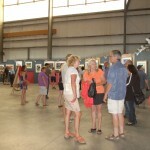 Joan will be “Painting on Location” at the Town of Qualicum Beach Pavilion. 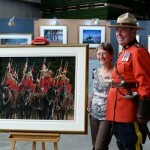 Meet Joan and watch her work on one of the RCMP Musical Ride Series.